This truck has spent most of its life in Altadena and Pasadena. Shortly after my discharge from Viet Nam I would see my friend John Reveley driving this 1950 Ford F1 around Altadena. He bought it from a fella who worked at Harry's Glass Shop for $100 because he could not see well enough to drive anymore. John used this truck for transportation around Humboldt State where he left it there when he became a fisherman in Alaska. Then John went into the motion picture business. This truck was his daily driver to work at movie locations and ended up appearing in several movies. It was used in fashion shoots by photographers such as: Carol Hodge, Carl Firth and the German magazine Der Spiegal. 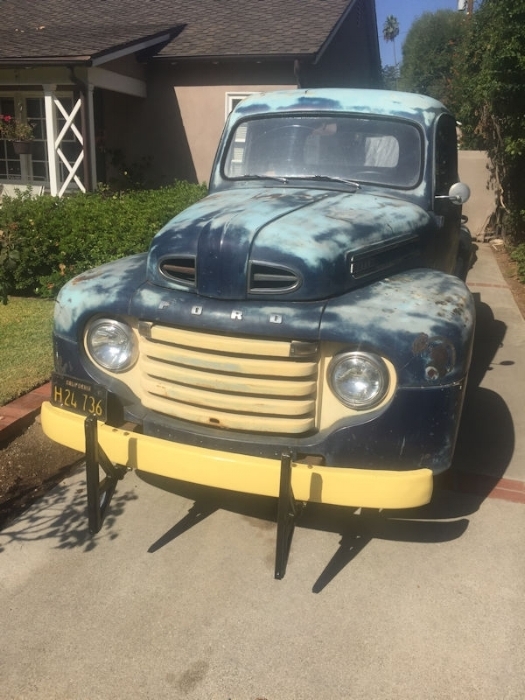 Years later on a Sunday afternoon in 2017 I was nosing around Craigslist and found a 1950 Ford F1. It had been posted for 20 minutes. I replied to the ad and a few minutes later my phone rang. The caller said, "Norm, this is John Reveley." The rest is history and I own the Altadena - Pasadena 1950 Blue Ford F1 pickup.